Trephination is a procedure that dates to pre-historic times. It was initially used as a means to release demons from the head, to relieve intercranial pressure, and to facilitate the elevation of depressed skull fragments. By the seventeenth century specialized surgical sets were made for this operation, and pictured is a very fine c. 1840s trephine set by W. & H. Hutchinson, Sheffield. The set is complete with all of its original instruments. Found are a trephine handle and a large and small bore trephine crown, a Dr. Hey's saw for cutting an uneven surface, an elevator lever for raising depressed bone and to aid in removing the bone disc cut with the trephine, and a scalpel used to lay bare the skull and as a second elevator (note the end of the handle). The trephine has an exceptionally fancy stem and the steel sliding pin mechanism of the crowns is coated in a spectacular bluing. The Hey’s saw has a most unusually shaped-head. The handles are made of horn. Several of the instruments are marked with the Hutchinson's name, and the maker’s embossed-card is attached to the lining of the inner lid. The card also has the notation $16. 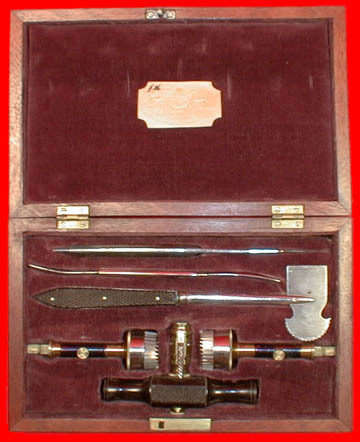 This is a set that would have been sold initially in the U.S. as new stock, and Hutchinson is a well-known exporter of surgical instruments to mid-nineteenth century America. For additional neurosurgical antiques and other medical antiques, visit the various sections of this web site.